Little man turns 21 weeks [5 months] this week, and whilst we were advised to start weaning early due to his reflux we haven't started properly yet. 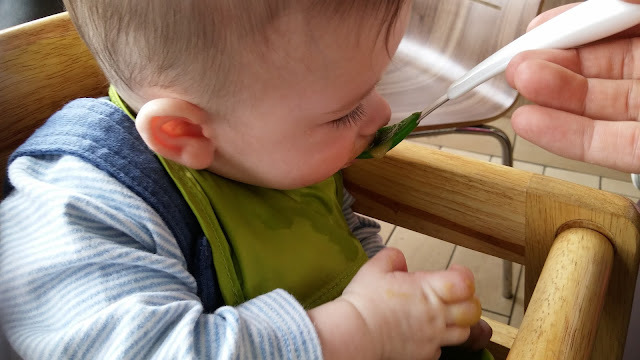 I simply have not had the time I want to devote to his weaning due to the summer holidays, although he has had the odd taste of different foods. 1. Little man can now sit for brief periods unsupported and sits with ease with support. He has good head control, which is one of the signs of readiness to wean. 2. He is almost 5 months, and therefore in the right age group for weaning. Whilst the recommended age is 6 months, some babies are ready before although not before 17 weeks/4 months. 3. He has good hand to mouth co-ordination. He is grabbing everything he can reach and putting it in his mouth. This includes food off mine or his sisters plates, toys, and his sisters hair! 5. He watches with great intent at us eating and tries to work out how to get the food in his mouth. 6. He has started drinking at least 6oz every hour, and he used to feed every 3 - 4 hours. 7. 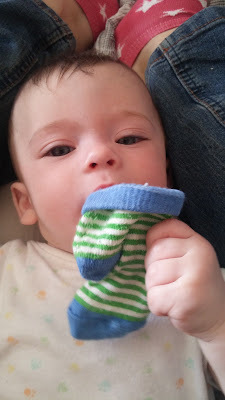 He is chewing his fist constantly. 8. He has started waking several times in the night and finishes a bottle, whereas he used to sleep through. I have begun to get things ready to start weaning him. I do a combination of baby led weaning and traditional weaning methods. Both my girls weaned this way and so I intend to do the same with Little Man. First on my list are cups, spoons, bowls and plates. I have been sent some of the OXO tot range to use with Little man. One of the things I really love about the OXO tot range is that they last all the way through from baby to toddler and beyond. Whilst little man has been sent a divider plate,the girls love using this plate for their picnics. The handy storage bowl with lid is perfect for taking snacks out for the girls as well as good for using for little man and his porridge. The lid has a handy place to level a spoon, and I love that the lid has a place to store food in also. The spoons from OXO tot have a soft silicon shape making it perfect for little mouths, but the handle of the spoon is a good ergonomically shape for me to hold. We also have a cup from the range which can be converted from first sippy cup to a proper drinking cup and once again the range extends from baby to toddler. Everything is dishwasher safe, which makes cleaning really easy too! 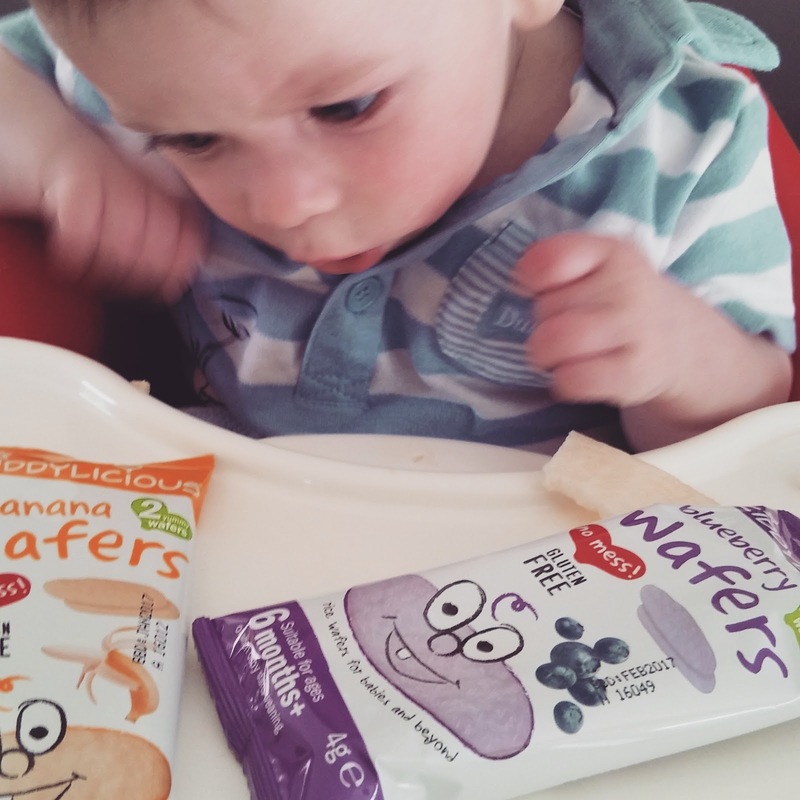 As little man will also be doing baby led weaning we have some rice wafers from kiddylicious to try. These wafers remind me of the texture of prawn crackers, but slightly softer. They are the perfect shape for a little hand to hold and once sucked they dissolve. The wafers are a great way to develop the coordination needed for feeding and as they dissolve help alleviate some of the stress associated with baby led weaning. There are three flavours carrot, berry and banana and little man has not developed a preference to either flavour, instead each one is met with joy and a desire to be eaten. 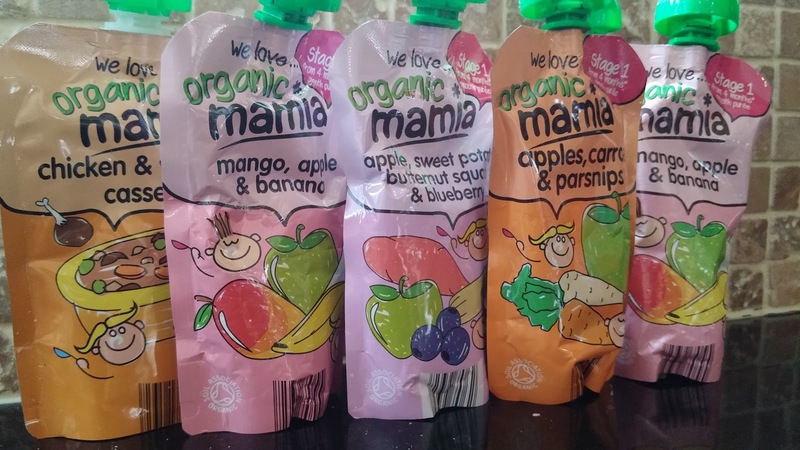 For his first tastes we are using the new range from Mamia, available at Aldi. These baby food pouches contain 100% organic fruits and veg and the stage 1 is puréed, making the consistency incredibly smooth. They are perfect for feeding when out and about and for giving little man the first taste of foods. At 59p they are also great value. Little man usually has around half a pouch at a time and really loves the different flavours we have tried him with. 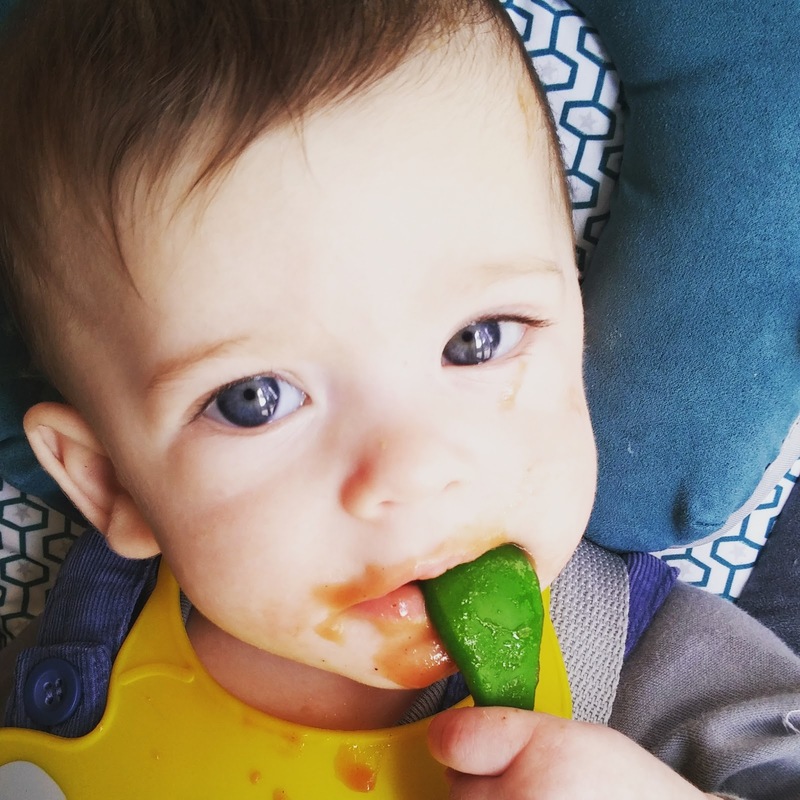 It is often said the best way to start weaning is with vegetables, rather than fruit, as this can lead to healthier choices later in life and a better acceptance of new foods. The Mamia range is perfect therefore for stating our weaning journey. As little man gets older, probably in a months time, I will move him from purée foods to those with a thicker consistency. The for aisha range will be perfect for this stage of his development. These baby food pouches contain some amazing flavours and have been developed by a mum, which for me means they have really thought about a baby and their needs. 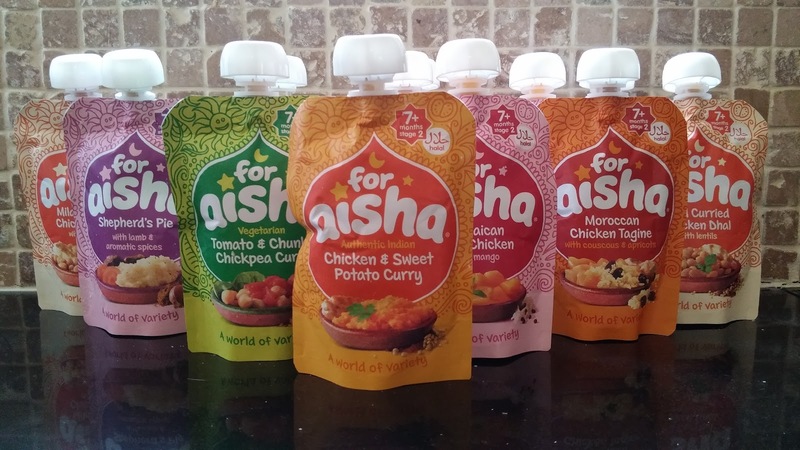 I love the sound of all the food available in the for aisha range with Shepherds Pie my particular favourite. I cannot wait to try these with little man and will be sharing our thoughts on Instagram when we do! As our weaning journey progresses I will be sharing on Instagram and YouTube, keep up to date with our progress as we share our weaning journey.